WMU earns second straight "Best for Vets" designation. KALAMAZOO-- For the second consecutive year, a national publication that serves all branches of the armed forces has identified Western Michigan University as Michigan's top-ranked school for outreach and service to veterans. Military Times' EDGE magazine announced its annual list of the nation's colleges and universities it calls "Best for Vets" in its November issue. WMU was ranked 33rd on the list of 59 schools nationally that earned the coveted designation. The only other Michigan school on the list is the University of Michigan-Flint, which came in at No. 41. Among other schools ranked by EDGE are Eastern Kentucky and Concord universities, which were tied for first place, and Arizona State, Ohio State and George Washington universities. Of the 59 schools honored, 51 are public institutions. This is the second such ranking by the monthly publication, which is a supplement to the widely distributed Military Times publications--Army Times, Navy Times, Air Force Times and Marine Corps Times. The magazine invited more than 4,000 of the nation's college and universities to report on their programs, policies and resources for veterans. EDGE chose this year's honorees using a new tool developed last spring based on polling of more than 500 student veterans on what they consider the most important services campuses can offer them. The resulting assessment tool is focused heavily on academics, staff knowledge of veterans' issues and the existence of critical core services such as a central veterans' office on campus. According to Tracey Moon, director of WMU's Office of Military and Veterans Affairs, the new selection criteria that was used changed dramatically from the previous year's criteria. This year's final list includes fewer schools than the first list, which appeared in 2010. WMU, however, remains Michigan's top-performing school. "The questionnaire EDGE used this year to evaluate its choices is the most extensive one I've ever seen," says Moon, who responds on behalf of WMU to such assessment tools. She notes that the University is routinely lauded for its focus on veterans, by other publications, including G.I. Jobs and Military Advanced Education. Earlier this fall, for instance, WMU was listed for the third consecutive year by G.I. Jobs as one of the nation's "Military Friendly" universities, a designation that WMU shares with several other Michigan schools. WMU has made veterans a priority over the past five years with a number of efforts to reach out to both veterans returning from deployment and National Guard members who might be called to serve at any time. The University has the largest population of Iraq and Afghanistan veterans among all of Michigan's 15 public universities. 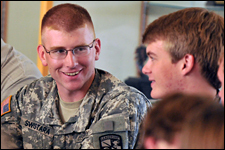 A mini GI bill in place since 2007 to cover tuition for an initial semester of enrollment, making it easy for a vet to transition quickly from active service to student life. A residency policy that recognizes veterans and their families as Michigan residents. An active campus veterans association. A special advocacy office aimed at helping veterans and active-duty national guard members transition in and out of academic life.